When all’s said and done, this has been one hell of a week. Even putting aside the loss of our beautiful Ruby (which in reality will take us all a while), it’s been a bit of a stinker. All three Off-Homestead workers have had their share of plain old bad days. In a couple of cases, these were the culmination of ongoing situations, the sort which needed to be officially confronted and addressed. Generally in these cases, once the necessary appointment has been scheduled and you’re in a holding pattern, you inevitably become absolutely certain you are over reacting or have utterly misread the situation; but thankfully in both the incidents of this week, despite any misgivings and a great deal of fingernail gnawing, validity was recognised and progress promised, at least. In the kitchen things have been progressing well but sometimes the whole “project management” deal becomes a tad overwhelming. The delivery of the new appliances, whilst exciting, was a lesson in the importance of asking lots of questions; even dumb ones. For example, when you opt for delivery but not wiring in of your brand new oven, the large, multi national company we dealt with saw their duties ending (despite the hefty wad of cash we parted with) once the appliance was standing in the middle of the driveway. We managed to cajole them into manhandling it into the middle of our lounge, but that was their limit and there it stood, still on its pallet, still in it’s cardboard case. Long story short, they finally came back, attached the legs to our glorious new cooker, and the delivery note was signed but only after some protracted telephone calls and a flying visit to their store. We would have preferred spending time in the garden, but such is life. With the electrician booked for Thursday, some last minute cabinet assembly of the pantry was required. The size of this project required all hands on deck, so after dinner the Homestead reverberated to the gentle – I said GENTLE – tap of hammers and the muffled howls as yet another finger was inadvertently pinched between panels. We finished it, though, and just in time. Thursday was given over to hosting Will and Sam, the electricians. These two are professional, fast working, and affable but they require access all areas and the control of the electrical supply to the Homestead. At least we could tackle the outstanding gardening and, on waving them off, we spent a great deal of time looking at our sparkly new appliances and light fittings and sighing. Oh, ’tis a thing of beauty; or at least we can see the promise of it now. We didn’t spend too much time just standing around, however, as this week culminated in two birthdays: The Renovator’s on Friday and The Farmer’s on Saturday. Therefore the first things to come out of our new oven were two birthday cakes: one banana with cream cheese icing and one chocolate with a truckload of ganash (see if you can guess which belongs to whom). So the week, which also had a full day field trip for Farm Girl, a sulky hen, and a nor’wester so strong it blew out all our planted pea seedlings, finished with a meal out, a great deal of cake eating and a large percentage of us opting for a Saturday afternoon snooze. that re-affixed the Homestead’s collective smile and got us wishing on a star again. This entry was posted in Union Homestead and tagged a day in the life, Disney, hard times, Homestead, Homesteader, homesteading, life, sage words, trials, ups and downs, Walt Disney, week, word, words. Bookmark the permalink. The new stove! It’s in! You’ve christened it! Enough with the exclamations, but seriously, I’m so thrilled for you, and two birthday cakes seems like a fabulous baptism. I have no clue which cake belongs to who…I’m going to guess wildly and say that the uber chocolate confection is Renovator and the banana cream cheese is Farmer. Did you notice the set of three in your week? Ruby, official confrontations and the stove issues. I bet the worst is over. I think the British version of Walt Disney’s line of thinking would be along the lines of “builds character” and sometimes it does feel like one has enough character to be going on with. On the Walt Disney note, however, I only just found a youtube of a man who sings 20+ characters singing “Let it Go” – from Winnie the Pooh to Sebastien to Pumbaa. No doubt Farm Girl heard it a year ago. And in rugby news, go All Blacks! Their win against South Africa made the news way up here. Thanks for your enthusiastic exclamations 🙂 The stove is wonderful but like all new things also terrifying. I daren’t move an inch away from the stovetop least a pot boils over. I am at base a sloppy cook. At the risk of ruining it for others, The Farmer is the chocolate fanatic. Drove me mad as a child as it was the only thing he considered a treat and it;s not the sort of thing handed out … and he never mastered that art of thanking someone for yet another grape flavoured lollypop. Hoping the whole “bad luck comes in threes” works this time around as we’re all feeling a little raw. Character be damned… and yes, we found the Let It Go guy quite recently – very clever. As for the All Blacks, I really really really wish I cared more as it makes me feel like an utter spoilsport, but our national game does nothing for me at all. I just don’t get it. Terrible, I know. I don’t know rugby at all, don’t know the rules, don’t know the teams, and that despite 4 step brothers who were avid players. I don’t even know how I noticed the headline about the All Blacks. There was that movie a few years with Matt Damon though…and as a Canuck, I’m in a similar place to you with your disinterest in rugby – I have no idea about hockey, can’t see the puck when it’s on TV and have never been to a game played by anyone older than 12. It’s almost blasphemous according to my brother. Here’s hoping you have a more normal week and that trouble is behind you. What a week, how could the delivery people behave like that, were they Kiwis? Good luck with the new stove and all the rest of the Homestead’s undertakings. Good looking appliance. Customer service seems to be a worldwide oxymoron these days. What a difficult week for you – I am sorry! I understand that feeling of having over-reacted as soon as an appointment is made – both my husband and I do it, especially for Dr’s appointments. The new oven looks a beauty! I love having new appliances but am always so nervous about using them and spend ages worrying in case I’ve mis-read the instructions (things are so complicated these days, aren’t they?). Other members of the household aren’t so inhibited fortunately; I just follow on after them, grumbling and cleaning up the spills and mess on *my* new ‘labour-saving’ device. I’m so jealous of your new oven… mine is old and clunky, but it still works and in the spirit of sustainability I’m not going to replace it until it gives up the ghost… which leaves me both hoping for its demise and dreading the time it no longer works and I might have to make big kitchen-related decisions. AAAAAAHHHHHH! Renovations! And the associated stress! 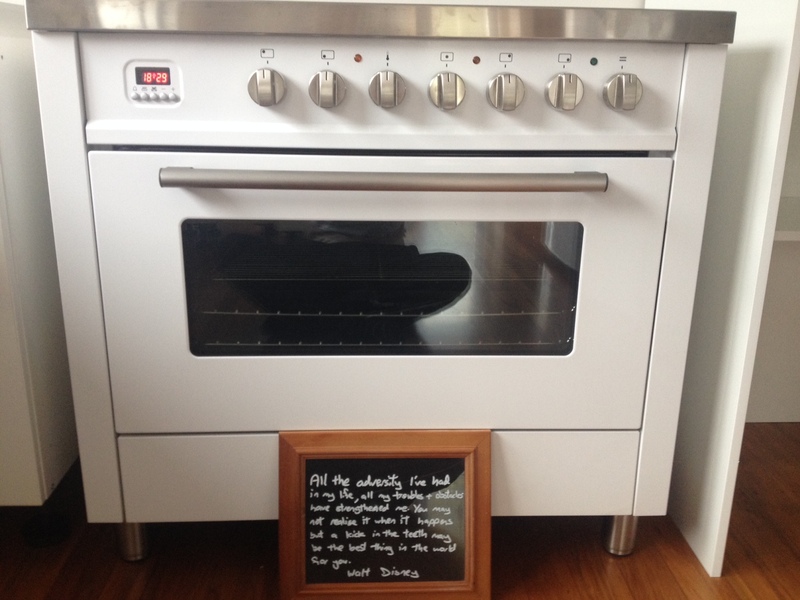 With a bit of luck, the agony will be worth it – a nice, new, shiny kitchen.